You all might be wondering then what is THE best way to consume a mango. Well.. just take a nice.. ripe.. native variety mango from fridge..
wash it.. gently crush it with the skin on it so that the pulp becomes loose inside the fruit.. gently pinch off the peduncle (stalk) from the fruit.. close your eyes.. take your full concentration to your taste buds.. drink the juicy pulp directly from the fruit. 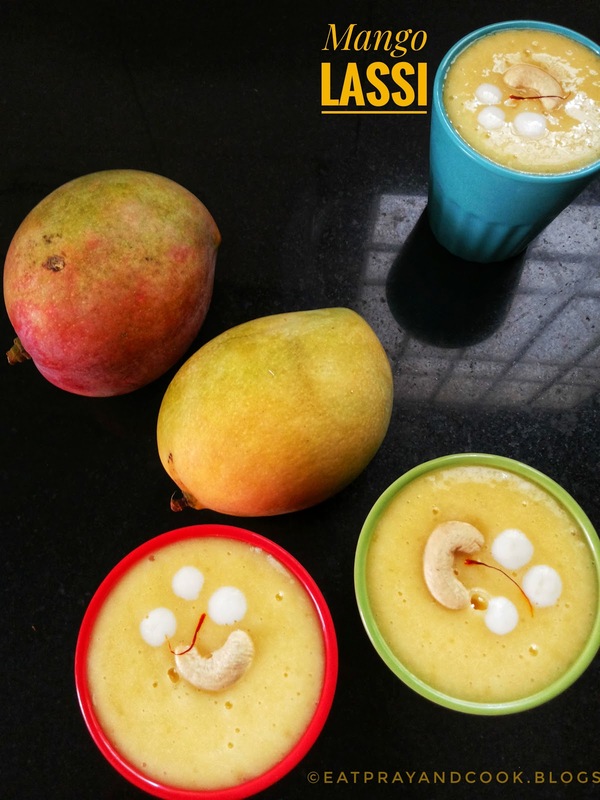 Aren't you getting goose bumps as you imagine this?😇 There cannot be any better way to consume a good mango other than just eating it as it is ! Mango lassi - the first time I heard and tasted this drink was 10 years ago, in Bombay Bar & Grill, an Indian restaurant near Pittsfield in US. It tasted soooo good.. I couldn't stop with just one mango lassi. 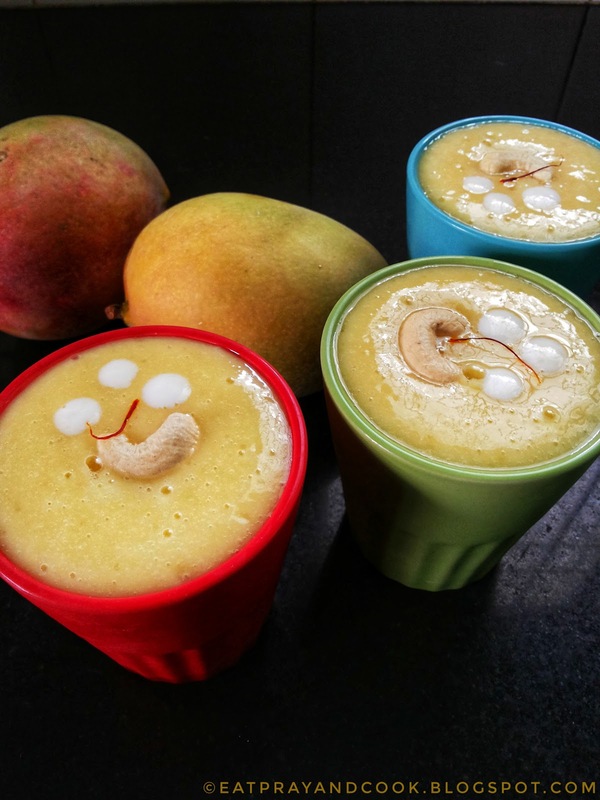 We never get any good flavourful mangoes in US.. then.. the secret was canned mango pulp! That's it.. from that day on.. any parties in my house or picnics.. mango lassi will be on menu. Easy to make and tasty to drink. I felt that, cooking was easier in US, except the fermentation of yogurt and idli batter. I never had the idea of using the items thriftily. All the grocery packs were big.. e.g., big oil packs.. pulses packet all big.. spice packets bigger.. eggs pack of 12.. milk 4 gallons pack.. buy them all and stock up. They never used to spoil how ever long they sit in our pantry. I thought that the credit went to the weather there. But.. when a person can fall sick in that weather, then how come these groceries alone don't spoil.. hmm.. preservatives! 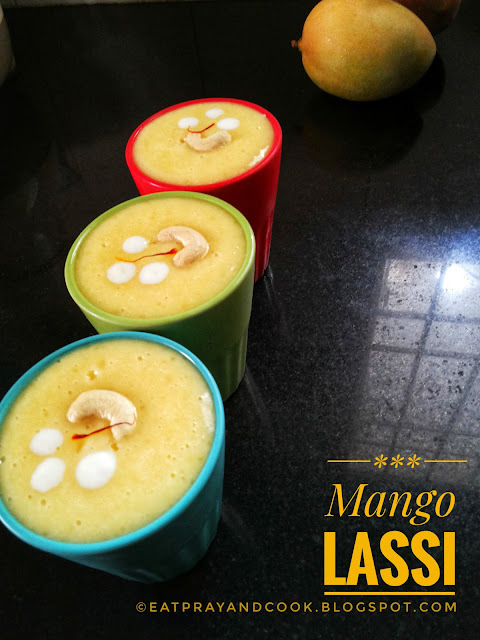 Coming back to mango lassi.. here in India, I buy some local native variety mangoes like Banganapalli, Imampasand, Neelam, Sendhura and more over my mother's house mangoes are there to fill the gaps. I prefer to make lassi with Alfonsa or Banganapalli. Fresh mango lassi on a sunny afternoon with the touch of our favourite spice for flavour ( ..guess which spice?). Most of the time when we browse the net.. we might come across very familiar or simple recipe.. even though you won't bother to go through the recipe.. you might get a craving for it and you want to eat it then. This is one such post. 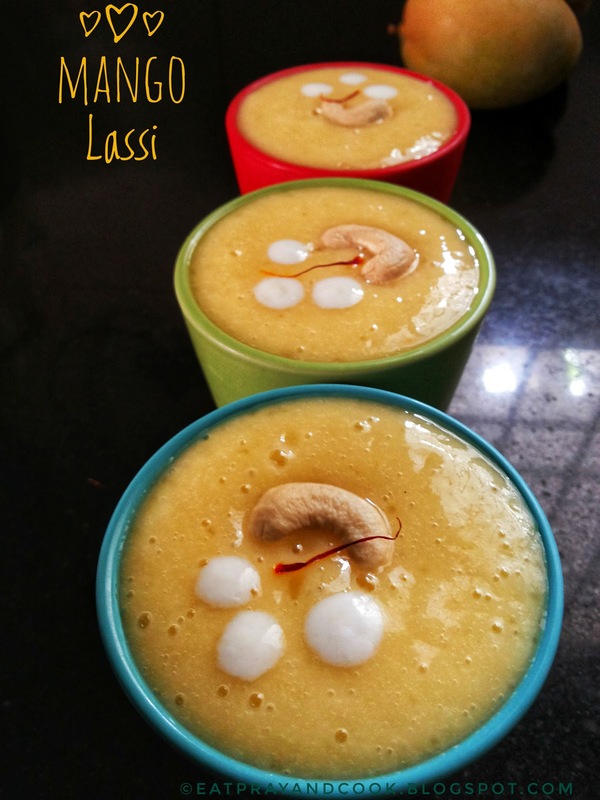 This might not be a new recipe for most of you.. or some of you might have a better version of this mango lassi. But after reading this post or seeing the pictures don't you want to make it today or tomorrow and beat the heat with your family? That's it. Mission accomplished. "யாம் பெற்ற இன்பம் பெறுக இவ்வையகம்" - means "let the world get the happiness which I got". Now to the recipe of mango lassi..
Wash and peel the skin of the mangoes. cut into pieces. take the pieces of mango into a blender and make a smooth puree of it. now add yogurt, sugar, nutmeg powder and ice cubes if necessary and run the blender to get a smooth and silky lassi. 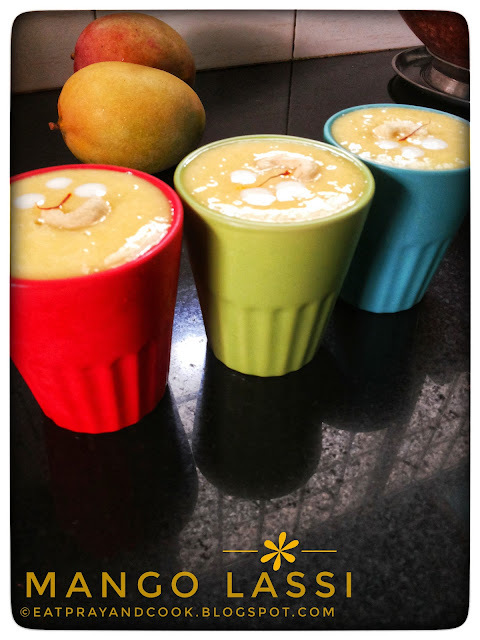 the world famous mango lassi is ready to be consumed. Pour it in tall glasses and serve. I like it with few cashews on top. You can avoid sugar and use honey instead. You can also use cardamom powder instead of nutmeg powder. You can add little water if you find the drink to be too thick.